The book launch of "Deep Search: The Politics of Search Beyond Google" is accompanied by a roundtable discussion which is going to address the cultural, political and social dimensions in dealing with search engines. These engines are never just practical tools to deal with information overload, but embed political strategies in seemingly neutral code. Some of the questions to be discussed are: What do we win, and what do we lose when we move from an analogue to a digital information order? How is computer readable significance produced? How is meaning involved in machine communication? Where is the emancipatory potential of having access to such vast amounts of information? What are the dangers of our reliance on search engines? And are there any approaches that do not follow the currently dominating paradigm of Google? 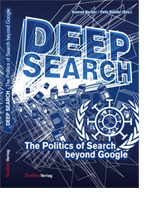 The World-Information Institute has published the book "Deep Search: The Politics of Search Beyond Google" as a follow-up to a symposium held in Vienna, Austria, in November 2008 which will be continued on May 28 this year. The volume, edited by Konrad Becker and Felix Stalder, is a collection of 13 texts that investigate the social and political dimensions of Web search and addresses urgent issues of culture, context and classification in information systems. Article authors are Konrad Becker, Robert Darnton, Paul Duguid, Joris van Hoboken, Claire Lobet-Maris, Geert Lovink, Lev Manovich, Katja Mayer, Metahaven, Matteo Pasquinelli, Bernhard Rieder,Theo Röhle, Richard Rogers, and Felix Stalder & Christine Mayer.